Wowza Media Systems uses a industry-proven approach of building its partners ecosystem. This includes approving streaming and product partners as well as encouraging software consultants to build a variety of Wowza-based applications. When consultants builds some customer product, they often need to provide some reporting tool in addition to a general functionality. They either build their own custom applications or search for existing solutions. Let's see how WMSPanel can help Wowza consultants. 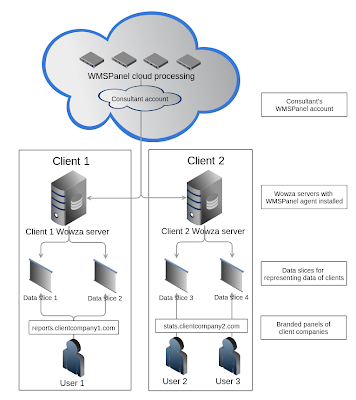 Let's take a look at the picture showing a consultant who has two clients that need reporting for their Wowza servers. Let's say you're a consultant and you're making custom projects for Client 1 and Client 2. You sign up and get familiar with WMSPanel during the free 2 weeks trial period. For Client 1 you install our agent to Wowza server and set up white label for some custom domain like reports.clientcompany1.com. Then you create data slices for Client 1 statistics and assign client's users there. For Client 2 you also install WMSPanel agent on any number of the servers. White label is also set up somewhere at stats.clientcompany2.com. This might be a client who provides some streaming media services hence the need for multiple data slices and multiple users. Thus, required slices are created with proper user accounts. Each user may see his stats without any intersection with others. When you subscribe to WMSPanel you pay for the slices created for your clients and get significant discount comparing to the price which your clients would pay having their own accounts. You can use a lot of additional functionality for any of your customers free of charge. Statistics import API will deliver processed daily stats in convenient format. you don't spend your time building special reporting solution - it's already here. Regardless of whether your clients handle live streaming or video on demand, WMSPanel will improve their user experience and will help you build better streaming solutions. Now sign up and try our platform to see how it can help your business. Contact us if you have any additional questions or concerns.